Located in West Java and within easy reach of Jakarta, the city of Bandung was established towards the end of the 19th century and is quite simply huge, and contrasts greatly with the lush countryside around the Puncak Pass. Bandung is filled with busy streets, interesting suburbs and Sundanese culture, and is West Java's proud capital. Offering visitors a selection of modern shopping malls, lively bars, Indonesian restaurants, stylish hotels and unexpected tourism opportunities, Bandung is a dynamic city and also appeals to locals from all walks of life. Art Deco buildings now make up an important part of the skyline and add much needed character to the city. Tourists often come to Bandung because it is no near to so many wonderful volcanic peaks, natural springs and spreading tea plantations. The Bandung Tourist Information Centre is located within the central mosque known as the Masjid Agung, next to the Alun Alun square. As West Java's capital city, Bandung is a great place for some serious sightseeing and is so popular with local Indonesians that many Javans from Jakarta head here at the weekend. Guided tours of Bandung are available and recommended, and take tourists all around the city and also to Garut and Pangandaran if you have the time. In the city centre, Jean's Street (Jalan Cihampelas) is one of the world's most unusual shopping streets, since it features larger-than-life models of super heroes from movies. Bandung Zoo is a reliable attraction for families and a good place to spend a sunny afternoon. For culture vultures, the Saung Angklung Udjo offers an insight into the traditional Indonesian bamboo musical instrument named the 'Angklung'. More information about Bandung Tourist Attractions. Although Bandung is a very busy and modern city, with glitzy shopping malls and office blocks, there is still a lot of colonial architecture remaining from its rich Dutch heritage. These landmarks include the distinctive Gedung Sate complex on the Jalan Diponegoro, which is currently used by the governor of West Java. Both the Cipaganti Mosque (Masjid Cipaganti) and the Villa Isola are further local sights of note in the city. For the best views of Bandung, head to the Dago Tea House (Dago Thee Huis) at Dago Hill, and be sure to bring your camera. More information about Bandung Landmarks and Monuments. Packed with information about the history of West Java, the museums of Bandung contain much regional memorabilia and fascinating West Java artefacts. Subjects covered include the Indonesian military forces, the historical Asian-African Conference, geology, fossils, contemporary sculptures and more traditional Indonesian art works. Popular galleries in Bandung include the Museum Barli, the NuArt Sculpture Park and also the Selasar Sunaryo Art Space (SSAS). More information about Bandung Museums and Bandung Art Galleries. Day trip opportunities surrounding Bandung are often a highlight of a holiday in Indonesia and allow tourists to experience some more West Javan highlights. Located on the north-eastern outskirts of Bandung and close to the Tangkuban Perahu crater is Ciater and its plentiful hot springs, while Maribaya lies to the east and features its very own thermal spa. To the south and next to the Sari Ater Hot Spring Resort is the market town of Lembang, as well as the tea plantations of Rancabali, and the Kawah Putih volcano and its beautiful crater lake. 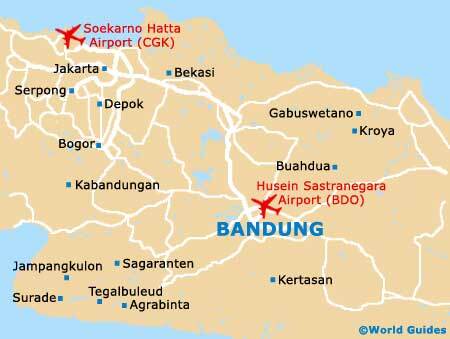 More information about Bandung Attractions Nearby.